After graduating from The Koc School in 2007, Pelinsu Bulut started her undergraduate education at New York University. She received her bachelor’s degree on Psychology and Linguistics-French in May 2011. During her undergraduate years she has been involved in various research projects on psycholinguistics, working as a research assistant. One of these projects was on immigrant families’ children acquiring English as their second language. The other research project, using brain imaging techniques, focused on the language decay of Parkinson’s disease patients. Apart from her time dedicated to research she was also volunteering in a theater group designed for children with special needs. After her return to Turkey in 2011, she worked at Koç University (Child Development Lab) for a year on a study funded by TÜBITAK: ‘‘Development of Spoken Language Comprehension of Children Acquiring Turkish’. Since September 2012 she has been a part of Gunisigi Child Center working as a Psychologist. She has completed the Floortime Introductory Course in April. In addition, she is also taking a 2-year course on ‘The Evaluation of Psychological Functioning of Children with Rorschach and other Projective Tests’. 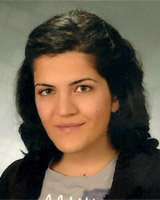 She has also been admitted to Istanbul Bilgi University Clinical Psychology Master’s Program which will start on fall 2013.